I am lucky enough to be celebrating my mom's 95th birthday today, separated by some miles but not by feeling. On the ground in Cleveland, she will be taken out for dinner by her favorite friends -- who are younger than I am --- to her favorite restaurant on Lake Erie with a view of the city lights and the water. Olga is a remarkable person. She is spunky, bright, curious, stubborn, flexible, loyal, opinionated, generous, optimistic, honest, and good. She graciously accepts assistance now that she is older, and has only praise and kind words for those who help her. She is passionate about current events, books, and the Cleveland Indians. For her knowledge and judgment, she was prized as a seller of children's books and an expert on the US First Ladies. Competitive and smart, she takes no prisoners in Scrabble or at the bridge table. She has expected a lot from life and given much back. Her company is sought by people of all ages because of the warmth of her personality, the range of her interests, and the modernity of her attitudes. I have never, in all my life, heard her say, "I'm too old for this." There is one beautiful and pivotal thing she does customarily say, however. Looking around, taking life in as it happens, she smiles and asks with pleasure, "What could be better than this?" 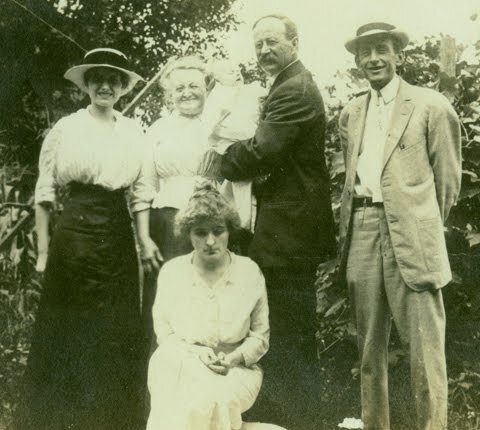 Baby Olga is held by her grandfather, the orchardist Harry Frank, nestled next to Lizzie Frank. The people in the fine hats are Baby Olga's parents, Luella Frank Shortess and Jesse Cloyd Shortess. Jesse was an artist who died young, and Luella was a postmistress and peach vendor. The mournful woman seated in the front is Cousin Edna Beaver, and we do not know why the occasion made her feel so low. I love this! Anyone who has met Olga could only agree with how you described her. Happy Birthday Olga! I remember when she went rafting down a river in Colorado at what I thought was the aged age of 60 or so. What a different perspective one gets as time moves on! She went to China and Tibet in her seventies, and after that never bought a single solitary thing made in China. Not an easy task. She would seek out store managers and tell them why she was walking out empty handed.